If you would like to be included on our EVENTS page, listings can be purchased anytime. See the attached order form below to place your order, or contact Larry Henley at 419-994-5488 or larry@henley-graphics.com. 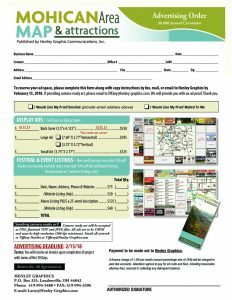 2019 print ad sales will begin November 2018. Ad space currently full, but we can put you on a waiting list. See the attached order form for sizes/pricing and contact Larry Henley at 419-994-5488 or larry@henley-graphics.com.